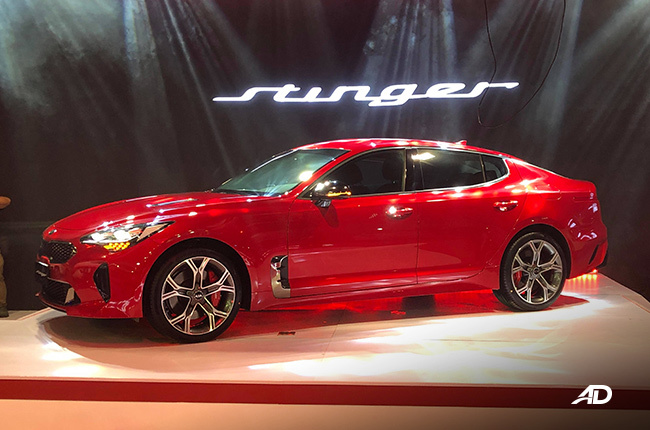 We got to admit; the Kia Stinger surely stuns. 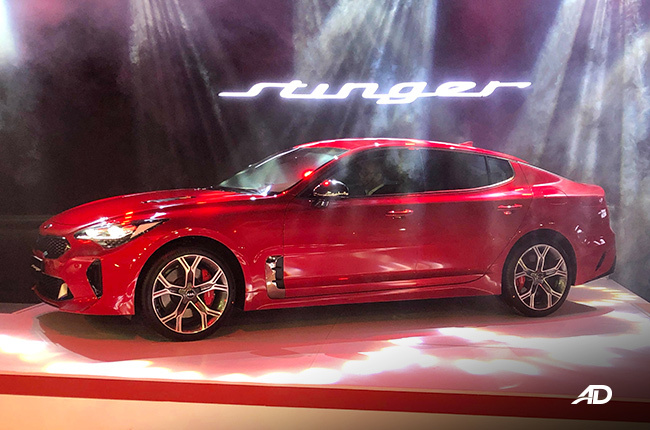 After two long years of waiting, Kia Philippines decided it is now time for the Stinger to own the spotlight at this year’s Manila International Auto Show (MIAS). 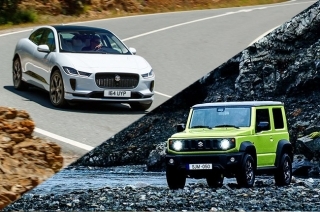 The local four-door sports sedan is now being taunted by the South Korean automaker and the whole World Trade Center is into it. The four-door sports sedan Stinger is the production model of the GT concept car that was showcased at the 2011 Los Angeles Auto Show. For two years, we’ve been drooling over the aggressive design with the dynamic ‘Tiger Nose’ grille. 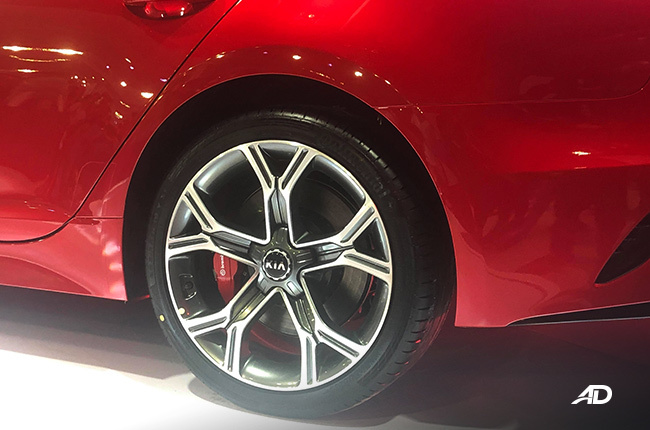 Now that it’s displayed for the whole four days of MIAS, we can closely observe its massive length with wheelbase extending up to 2,906 mm. 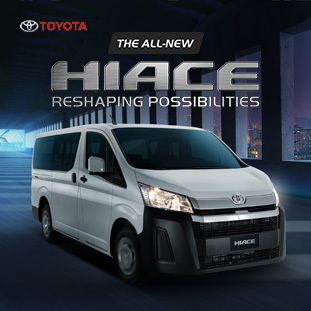 The sleek headlight and bumper design accentuate the long and slim tiger nose grille. The long hood, which is a third of the whole body, comes with blacked-out vents for that sportier appeal. 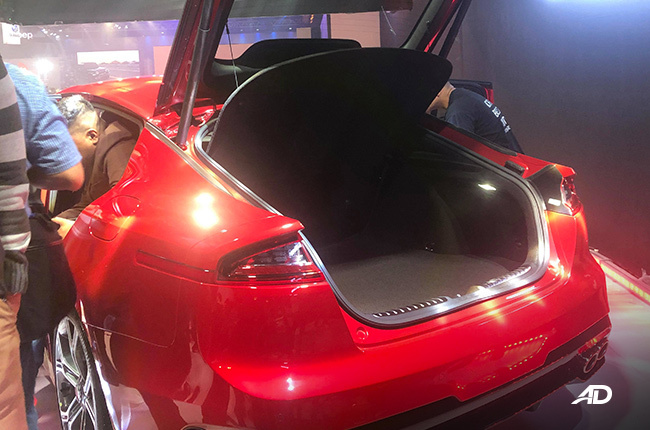 Meanwhile, on the rear are the connected triangular LED taillights. It also has quad-exhaust, integrated rear diffuser, and a shark fin antenna. Lastly, wrapping up the exterior is the fastback silhouette that goes well along with the long hood and wheelbase. 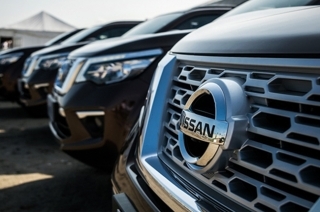 Knowing that the wheelbase is 2,906-long, expect to find a roomy cabin with considerable legroom and comfortable seating positions. Leather is found all over the cabin, from the dashboard to the seats, down to the minor elements and door panels. 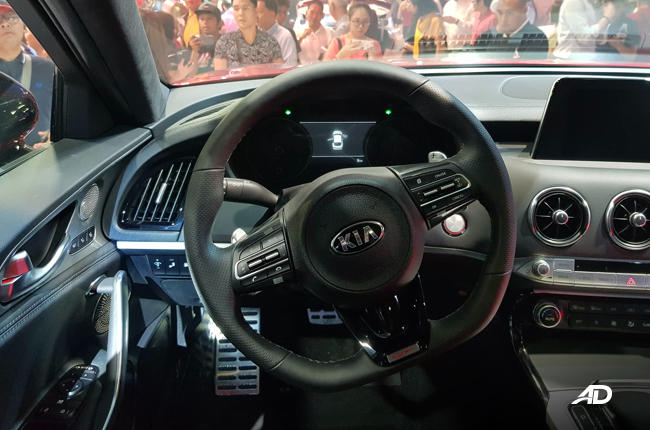 The dashboard is clad with fancy stitching, airplane-inspired radial air condition vents, and ergonomically arranged buttons for that minimalist cabin feel. 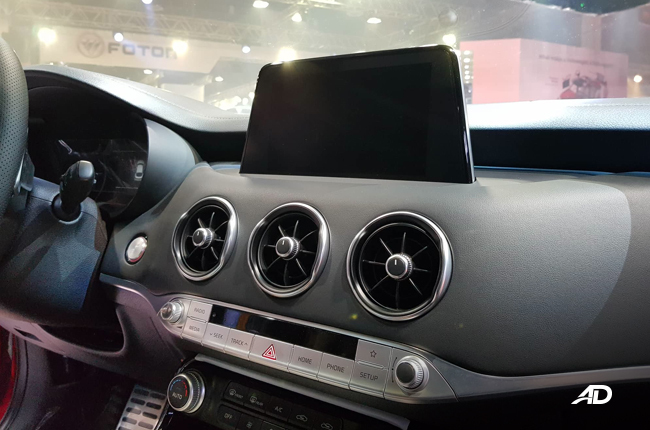 On the center of the dashboard is a floating seven-inch haptic touchscreen display. 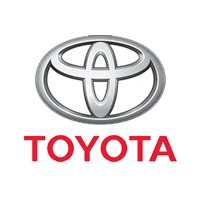 Audio quality is supported by 15 Harman/Kardon sound system with under-seat mounted subwoofers. That’s theatre-like surround sound entertainment for all five passengers in the cabin. Apart from the fully-digital instrument cluster, there’s also an adjustable head up display that maximizes the driver’s focus on the road. 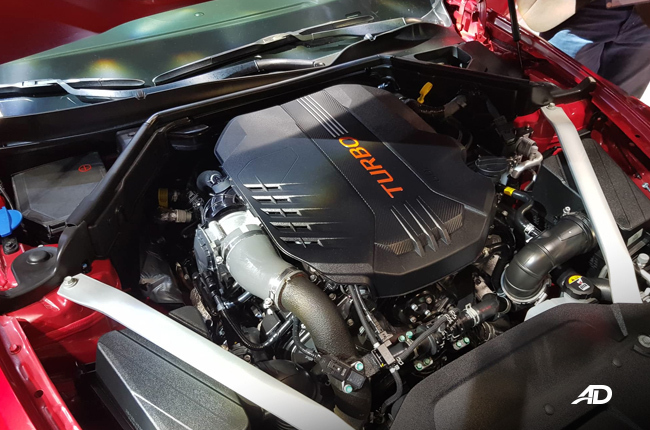 As for the power output, Kia Philippines went all out with the 3.3-liter V6 Lambda II engine that can spur 370 hp and a whopping 525 Nm of torque. This monster allows the car to achieve a 0 to 100 km/h run in 5.1 seconds. However, it’s just one of the two available engine options of the Stinger in the global market. 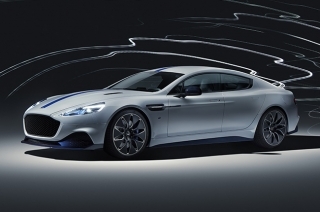 The other engine is the much smaller 2.0-liter turbocharged Theta-II engine, capable of 255 hp and 352 Nm of torque. 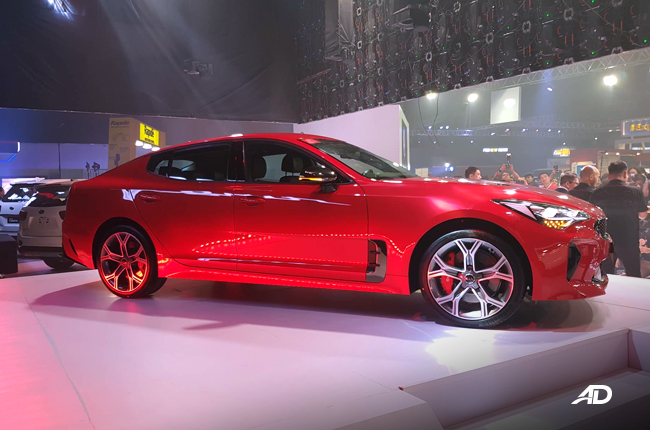 As sporty as a sports sedan, Kia also made sure that the Stinger doesn’t only project outstanding performance. 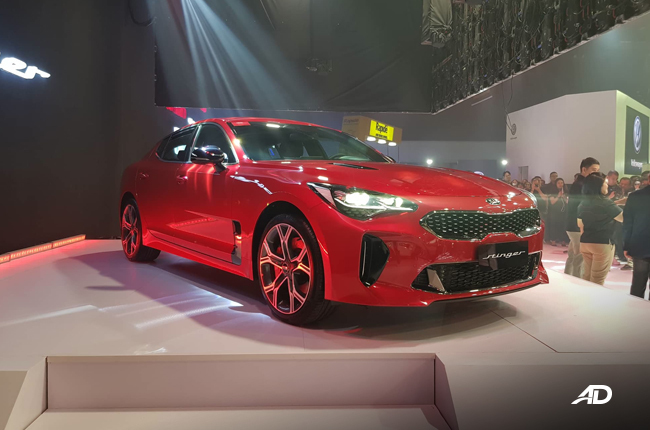 The South Korean marque stuffed the Stinger with Multiple Advanced Driver Assistance Systems (ADAS) that comes with Forward Collision Assistance, as well as an autonomous Emergency Braking. This adaptive collision mitigation system can detect both pedestrians and other vehicles in front. 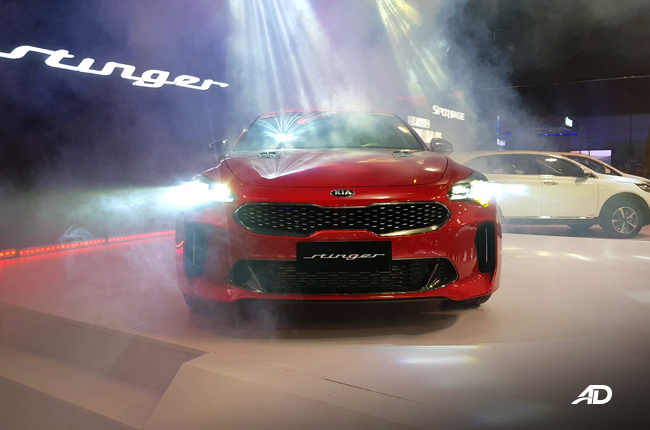 For the price, expect to take out around P3,235,000 off your bank account if you want the Stinger. 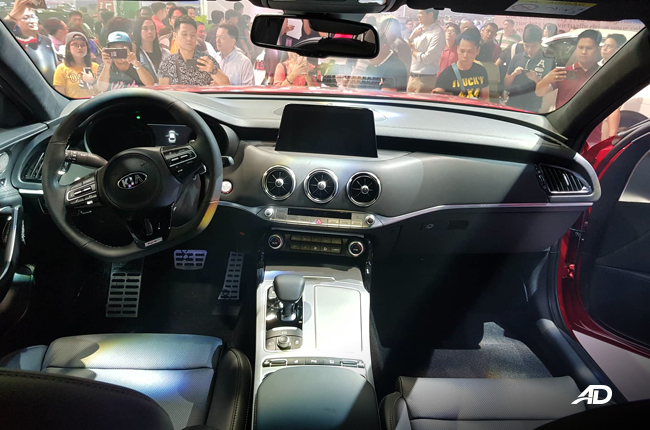 Considering its European segment rivals, this price point belongs to the more affordable spectrum, making it one of the more achievable four-door sports sedan to be offered in the Philippines.